In today’s age of technology, it’s important to make sure that your choice for orthodontic treatment includes diagnosis and treatment planning using the most advanced technologies available. 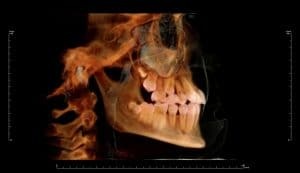 At Hidden Valley Orthodontics, we have employed the use of 3D cone beam x-ray technology for over 3 years now. This, along with our 10+ years use of intraoral digital scanners and in-house 3D printing, has allowed us to lead the charge in using technology to advance orthodontic treatment. Having this technology available has enabled Dr. Fortney to not only treat patients more efficiently but has also allowed her to diagnose obstructed airways and other breathing issues in children that may lead to issues in their growth and development. This can be a life changing issue to diagnose, especially if caught early! Using The i-CAT Cone Beam 3D Dental Imaging System allows Dr. Fortney the ability to provide quick, comfortable, and effective imaging allowing for the most accurate orthodontic diagnosis possible. Hidden Valley Orthodontics is proud to offer iTero Digital Impressions for our patients. Unpleasant putty impressions are a thing of the past with the iTero Digital system! Eliminates Putty Impressions – the most invasive procedure in daily orthodontic care. No more goopy, unpleasant aftertaste of traditional impressions. An increase in your comfort! Superior Accuracy – with no distortion from patient movement during set, removal of impression, or disinfection. Onscreen Visualization – allows for immediate adjustment to create the ideal orthodontic scan the first time. The iTero image appears on the screen as the orthodontist scans your mouth in real time!